12:00 PM – 2:00 PM Robot Test Facility (Bldg 207) Lunch with Demos – Ground Robots Sensors, Maneuvering, Mobility, Dexterity, and others. 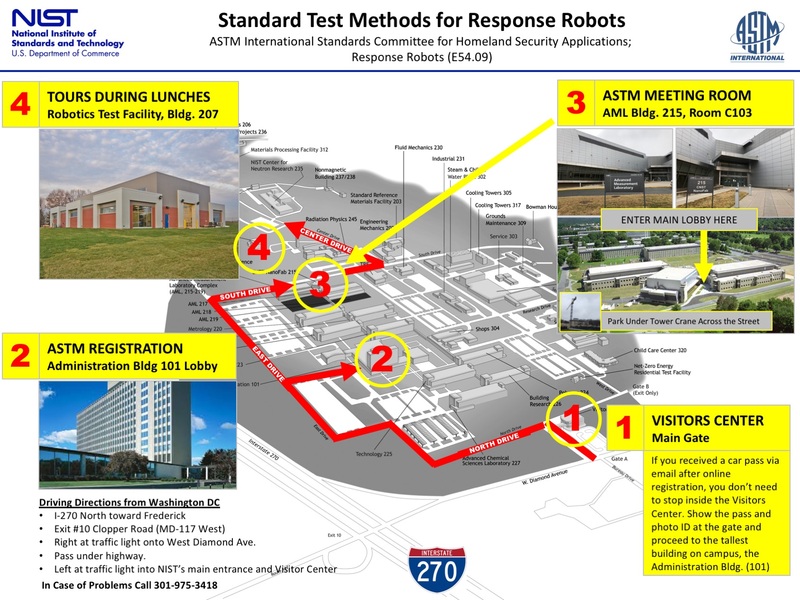 12:00 PM – 2:00 PM Robot Test Facility (Bldg 207) Lunch with Demos – Aerial test methods: Sensors, maneuvering, payloads, and others. Downloadable version of the agenda . For attendees that would prefer to call and make reservations, they simply need to mention the “NIST ASTM E54 Committee Meeting” block or the block code N54 to receive the special rate. The cut-off date for this block is January 25th, 2018.